Service of shipments of large and heavy cargo. 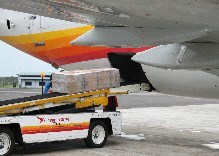 Surinam Airways cargo offers reliable transportation of large cargo to and from all its destinations and beyond with other carriers or by trucking companies. To be guaranteed the acceptence of these large shipments, it is mandatory to contact your nearest Surinam Airways office or handling agent in that area. Oversized cargo is most of the time general cargo or aircraft parts. The limit for acceptance depends on the aircraft type and or container size.